I’ve reached the point in my Seriously Whimsical art project where I’ve become impatient to get started. I can’t shove less exciting tasks out of the way fast enough. I mean, really. You have to go out and buy groceries, clean the house, work in the office and tie up the loose ends from the last project. Ugh. Use a cake decorator to draw with paper pulp ◊ then I should borrow books on cake decorating ◊ maybe even watch “Ultimate Cake Off”! 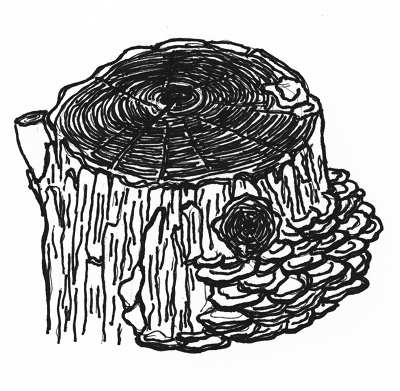 Pour plaster onto tree branches to pick up texture, then carve the plaster. What would be a good system for pressure treating and desiccating the pulp in latex without destroying the mold? Oven? Buy a desiccator? Then I start thinking about possible alternatives if one method doesn’t work! I so want to get started before I get overwhelmed with the possibilities and they become a spiderweb of what ifs. Everything I see and think becomes fodder for my whimsical gristmill. Excessive rain caused mushrooms to sprout all over the tree stump in my son’s back yard. Cool!! Any idea how many varieties of mushrooms you can find in Google? Wow! Artists wood-burn onto ” shelf mushrooms”, which these may be!! More possibilities! Fun! Or shelves . “Do you want to play Play-Doh, Grandma?” “Do I? !” Ya! What a gold mine of possibilities. Textures and tools. And impermanence. Just playing and fooling around. No pressure. What fun!! The ideas are endless. “Let’s go to the park, Grandma.” Oh Ya! "Green man & Moon" - by Knotty Inks. 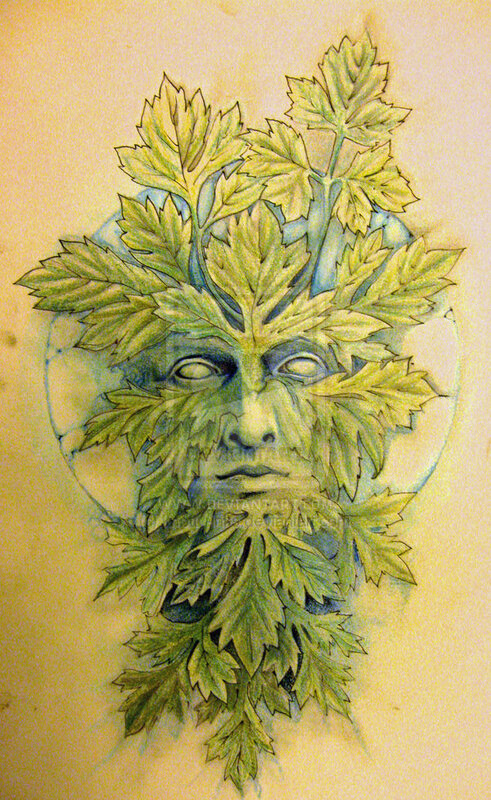 The Green Man is related to nature deities in many cultures, and is a symbol of rebirth. Maple leaves. Perfect for the Green Man I want to make. What a great place for the kids to climb in and play and use their imagination. Oh ya, and Grandma too. Climbing structures, boulders, a gazebo, a creeklet, tree bark, pea stones. “You’re fun, Grandma.” You too, Georgie and Joe. What a great day! P. S. Ooooh. I love Google. I’ve since discovered that Drain Cleaner is a desiccant, maybe I can make my own desiccator. Now, for pressure treating…. This entry was posted in Ponderings, Seriously Whimsical and tagged Art, Diana Hume, paper sculpture, ponder, seriously whimsical by artmyth. Bookmark the permalink.